It turns out that eating a handful of nuts daily could effectively keep colon cancer from recurring after surgery. In fact, research, from Dana-Farber Cancer Institute in Boston, suggests that eating certain nuts might prove to be as effective as chemotherapy, and may actually keep patients from dying. A daily handful or two of nuts may work as well as standard chemotherapy. That’s what an observational study tells us. Funded by the U.S. National Institutes of Health, the study looked at over 800 patients with stage III colon cancer. Stage III means the cancer may have spread to surrounding tissues, but hasn’t made its way to distant organs. They had also received surgery and chemotherapy for their colon cancer. According Clinicalresearch.com patients filled out diet questionnaires, which included questions regarding the amount of nuts they ate. During the observational study, the patients were followed for seven years after completing chemotherapy. Nearly one in five patients said they ate at least two ounces of nuts a week. Researchers found that those who ate two ounces or more of nuts per week had a 42 percent lower chance of cancer recurrence and 57 percent lower chance of death than those who did not eat nuts. What kind of nuts help cancer? Researchers found that tree nuts, like almonds and cashews, provided post-cancer benefits. 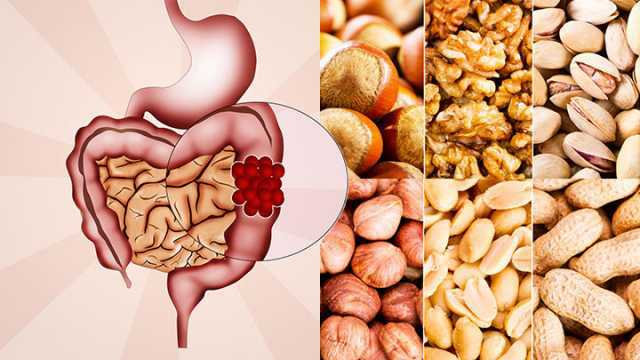 However, it seems that the benefits were only linked to tree nuts such as almonds, walnuts, hazelnuts, cashews, Brazil nuts, pistachios and pecans according to lead researcher Dr.Temidayo Fadelu, a clinical fellow at Dana-Farber. Further analysis revealed that peanuts and peanut butter did not provide any post colon-cancer benefits. Unlike tree nuts, peanuts fall within the legume family and are a cousin to well-known legumes such as peas, beans and lentils. A second study found that to improve the odds for survival, colon cancer patients should eat nuts along with an overall healthy diet and regular exercise. In fact, that study found that colon cancer survivors with the highest healthy lifestyle scores — healthy eating, exercising and maintaining a healthy weight — had a lower risk of death than those with the lowest scores. Two other long-running Harvard studies published in the New England Journal of Medicine found that people who ate nuts every day lived longer, healthier lives than people who didn’t eat nuts. The conclusions were gathered from nearly 120,000 participants who answered questions about their diets at the beginning of the studies in the 1980s. Then during a 30-year follow-up, they answered questions every two to four years. Participants were categorized into six groups, ranging from never eating nuts to eating them seven or more times per week. The more often people ate nuts, the lower their risk was of premature death. Eating nuts lowers LDL (“bad”) cholesterol and raises HDL (“good”) cholesterol, reports an earlier study by Dr. Penny Kris-Etherton, professor of medicine at the University of Pennsylvania. They also lower blood pressure and blood pressure responses to stress, according to Dr. Kris-Etherton. Etherton’s research also indicates that eating nuts regularly helps boost a process called reverse cholesterol transport. A process whereby HDL particles in the blood sweep out fatty plaque from clogged arteries. That’s because of the composition of nuts, which includes fiber, healthy fats, vitamins, minerals and phytochemicals. Together, these components in nuts provide cardioprotective, anticarcinogenic, anti-inflammatory and antioxidant properties. But can eating nuts daily make you gain weight? Despite being high in fat, nuts don’t tend to cause weight gain. If you’re worried that eating nuts might make you fat, since they’re high in fat, the fact is, frequent nut eaters are actually less likely to gain weight. In fact, those who eliminate fat from their diet tend to indulge more in carbohydrates. And the more carbs converting to sugar in the body, the fatter you get. A 2009 Harvard study found that higher nut consumption was not associated with weight gain. In fact, during an eight-year follow-up study of healthy, middle-aged women who reported eating nuts twice a week, researchers found that they had a slightly lower risk of weight gain and obesity. 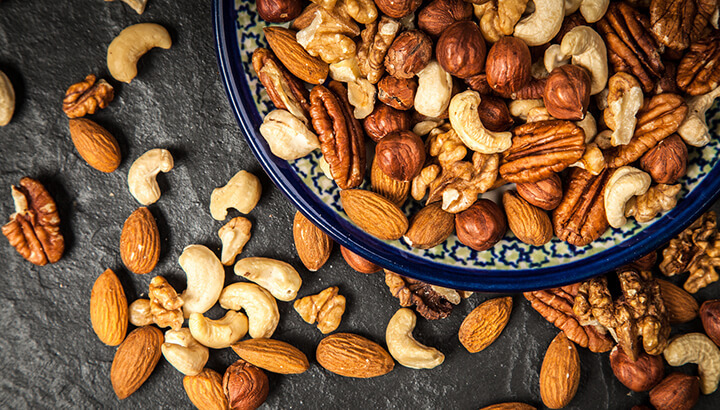 The result of this study suggests that adding nuts into your diet does not lead to greater weight gain and may actually help you control your weight. Instead, it was associated with a slightly lower risk of weight gain and obesity. 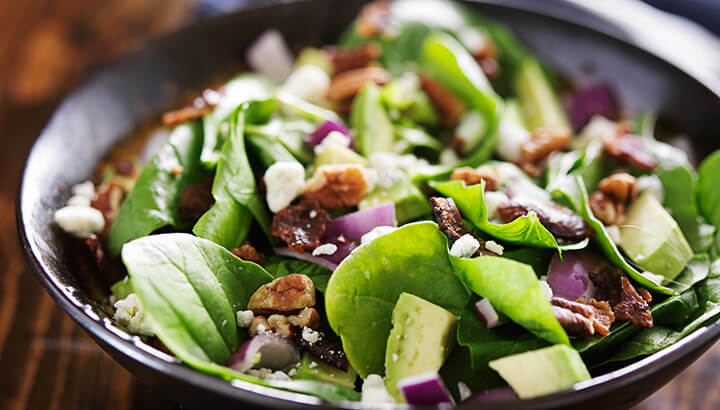 Add nuts to your salad for a quick fix of healthy fat. Sure, that pecan pie is loaded with nuts, but that may not be the best way to get your daily health fix. Here are other better ways to reap the many healthful benefits nuts provide. Tree nuts contain high amounts of healthy fatty acids, fiber and flavonoids, but don’t assume these studies are saying that you should forgo chemo for cashews, healthy diet and exercise. That would be irresponsible. However, these studies are very promising in that they encourage a healthy diet, including tree nuts and exercise, as a means to improve survival rate after colon cancer surgery. And even if you don’t have cancer, improve your average life expectancy by simply adding nuts to your diet. It certainly can’t hurt! Hey Buddy!, I found this information for you: "Scientists Say This Food May Help Colon Cancer". Here is the website link: https://www.thealternativedaily.com/nuts-may-help-colon-cancer/. Thank you.